Konkan railway concept was developed and pushed forward by the veteran Konkan leaders Madhu Dandavate and George Fernandes. Earlier the two strategic port cities were not directly linked by railway. After enormous chasing by these leaders the proposal of Konkan railway was finally accepted and the long awaited rail route running through the west coast of India and Western Ghats became operational from May 1998. It is a single line track waiting to be electrified and is open to both freight and passenger traffic. This rail route was welcomed by all the coastal cities between Mumbai and Mangalore who were highly benefitted by this convenient mode of transportation. The tremendous pressure on the state transport busses was partly released. Konkan is a beautiful region nestled partly in the Sahyadris and partly along the western coastal region. The rail route passing through many long tunnels and beautiful terrains offers a pleasant journey. If you travel by Konkan railway in the middle of the rainy season you will be able to catch some awesome views of the surrounding region. In very short span of time this route became more popular where important trains like Netravati express, Matsyagandha express and Konkan Kanya express are plying between different destinations. Konkan Kanya express is the best train on the Konkan route to reach the most glamorous tourist destination Malvan in Maharashtra. It is at a convenient distance from the railway stations Sindhudurg and Kudal. Konkan Kanya is running between Mumbai CST and Madgaon Junction covering a distance of 580 Km and is most suitable for travelling to Goa. 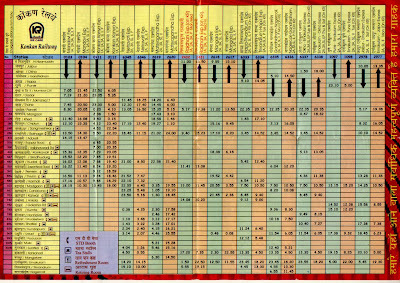 Konkan railway timetable and reservation facilities are available at many major stations like CST and Dadar. 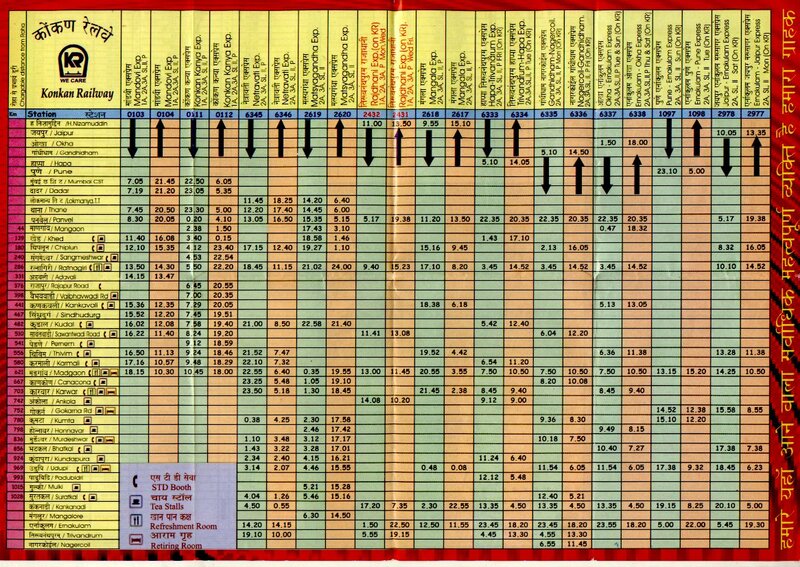 This monsoon Konkan railway has introduced a revised timetable operational from 10th of June to 31st October 2012. They have made a few changes in the timings of the trains to cope with slower speed of the trains during monsoon to avoid mishaps. 1) Tr. No 12617, Ernakulum Junction to Hazarat Nizamuddin, Mangala Express will have an early start from Ernakulum at 10.45 hrs instead of present 13.10 hrs. 2) Tr. No 16337/16338, Express trains between Ernakulum and Okha will run up to Hapa only. 3) While there will be no other change in the timings of trains going away from Kerala till Mangalore Junction, there will be change in their timings after Mangalore Junction and at destination stations. 4) Timings of trains reaching their destination points at Ernakulum Jn/ Thiruvananthapuram Central/ Kochuveli/ Nagercoil Jn after travelling through Konkan will also have changes as published in monsoon time table. While visiting Malvan or Goa by Konkan railways you can book the tickets online by visiting the website of Konkan railways or at the booking windows of the central railway. Make your reservations in advance since this route is busy throughout the year and especially during the festival season. There are many resorts and hotels in Malvan where you can enjoy a pleasant stay while visiting all the popular beaches, forts, temples and gardens in the region. But, accommodations provided by Hotel Sagar Kinara offers a truly comfortable stay at reasonable rates.